Considering getting a Greenland Dog? Native to Greenland as the name suggests, the Greenland Dog is a working dog originally developed to be a sled dog. It closely resembles both the Siberian Husky and the Alaskan Malamute when it comes to its size and height, standing 51 to 68 centimetres and weighing 66 to 70 pounds. The Greenland Dog is an intelligent, independent, high-energy dog and likes nothing more than to be put to work. As such, it is not best suited to first-time dog owners. The Greenland Dog is an active dog breed that needs to be kept busy. Here is complete information about this sled dog from Greenland. The Greenland dog is believed to be an ancient breed that arrived in Greenland 4,000 years ago. It is thought that the Greenland Dog, including the Canadian Eskimo Dog, descended from ancient canine breeds associated with the Thule people who relied on sled dogs for transportation in Siberia. Though Greenland dogs have been around for centuries, the breed made its first appearance in the UK around 1750. It became popular as a versatile working dog breed and have participated in the Darlington dog show in 1875. In 1880, the Greenland dog was recognised by The Kennel Club and more than a century later by the United Kennel Club in 1996. 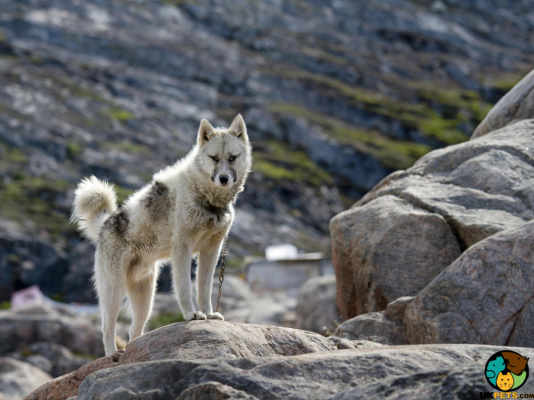 Although they are gaining popularity outside of Greenland, the Greenland Dog remains a rare breed. 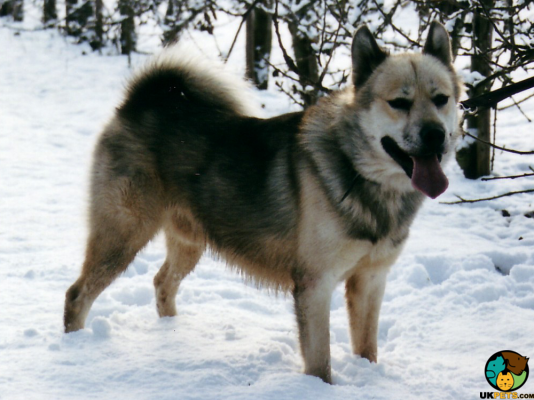 The Greenland Dog is a robust and heavy-built dog with a wolfish appearance. It has a broad, wedge-shaped head, small pricked triangular ears, slightly tilted eyes that show its keen and fearless expression, and black or brown nose that follows the colour of its coat. Its muzzles are somewhat long gently tapering toward the nose. This Arctic dog breed has muscular and sturdy legs that are covered with shorter hair compared to the rest of its body, well-muscled shoulders, deep chest, well-sprung ribs, and a large bushy tail that rolls across its back. When it comes to its coat, the Greenland Dog wears a thick double layered coat that is medium in length. The undercoat is dense, soft and woolly, providing warmth, while the topcoat is long and coarse to protect against the cold. Its hair, neck, withers, the underside of the tail have longer hair than it is in other areas of the body such as its legs, head and underbellies. Its coat comes in several colours, which are a various combination of white, brown, black, red and grey. Coat care is relatively easy to do despite its thick coat. Brushing its coat at least twice a week will suffice to remove dead and loose hair and keep its coat dirt-free. However, frequent brushing is needed during the shedding season, when they shed more, during spring and autumn. The rest is basic grooming, which includes: trimming the nails to avoid painful overgrowth, brushing the teeth to minimise tartar build-up and prevent gum disease and lastly, checking its ears for signs of potential infection such as redness, pain and bad odour. Reserved and independent, the Greenland Dog can also be an affectionate dog breed when it forms strong bonds with its owners. Since the breed remains a working dog, it is not content to simply be inside the house all day long. This dog breed needs to have a job to do or engage in vigorous activities such as running, jogging and hiking. With that said, the Greenland Dog demands ample space to be comfortable, so small city apartments is not for them. The Greenland Dog is also not suitable for family pets where there are young children. This dog can be quite rambunctious in a home environment and will likely accidentally knock over toddlers during playtime. Any interaction with this breed and the children must be supervised at all times to avoid any accidents. When it comes to its relationship with other household pets, Greenland Dogs, being pack animals, are generally good around other dogs. However, it's not the same with smaller animals. They are even-tempered and will rarely show any aggressive behaviour to strangers and will prefer to keep their distance until they become familiar with them. Greenland Dogs are generally quiet and calm dogs, which is why they are not ideal guard dogs. However, they will not hesitate to howl, not bark, when the mood suits them. They are not the best choice for inexperienced dog owners because this dog will need a steady handler to look to for instruction and direction. A typical serving of an adult Greenland Dog is 2.5 to 3 cups of high-quality dry dog food per day. Divide it into equal halves – brunch and dinner. Don't simply take our word for it or any other online resources you come across. Our best recommendation is to consult a veterinarian to find out the best dog food suitable for your Greenland Dog. The Greenland Dog is a medium to large dog breed, which should be fed with premium commercial dog food formulated for its size. Since it is a high-energy working breed, a diet that suits its activity level and size may be more appropriate. Keep in mind that Greenland Dogs are known to suffer from bloat, so strict feeding schedules must be followed. Greenland Dogs are healthy breeds that can live anywhere from 10 to 14 years. However, they are still predisposed to health conditions common to its breed. Make sure to have your Greenland Dog checked for Hip and Elbow Dysplasia, Primary Lens Luxation, Glaucoma, Bloat/Gastric Torsion, and ear infections. 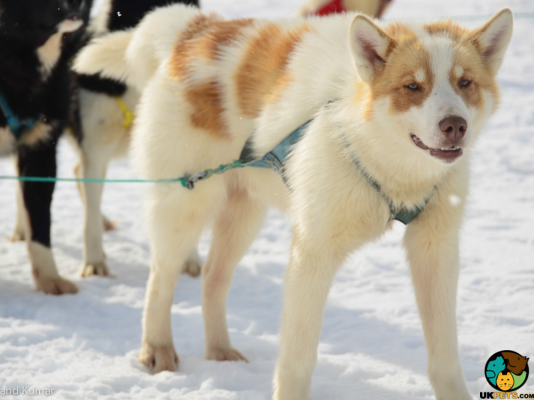 Greenland Dogs have retained its purpose as a working dog, which means they require plenty of exercises. They will need more than occasional walks in the park, instead only a two hours' worth of exercise will suffice to keep them happy dogs. You can take them on a run, jog, or hike so they can let off steam and use its energy. If you are not an active person and not fond of outdoor activities, we suggest that you find another dog breed. Are you excited to be getting a Greenland Dog? Getting a dog is fulfilling since you get another friend, companion, even family member. Like any addition to the family, it requires money. Aside from that realisation, Greenland Dogs are rare breeds, and so buyers have to be put on a waitlist. Regardless whether you're convinced to buy a Greenland Dog, it pays to examine how much a person will need to spend on average. In rough estimates, taking care of a Greenland Dog will cost you around £70 to £110 a month, minus the initial cost to buy the puppy. Also, this estimated cost will also depend on the level of pet insurance coverage you avail for your Greenland Dog. Is a Greenland Dog Right for You? The Greenland Dog is intelligent, independent and reserved. It is not ideal for new owners without experience in handling active dogs. It is best suited for homes with a large space, like a securely fenced yard. Greenland Dogs are quiet breeds and so are not ideal guard dogs, but they howl when the mood strikes them. They are pack animals and as such, get on well with other dogs. Greenland Dogs can be affectionate if they form bonds with their owners.